With less flexible rental budgets, expatriates who formerly could rent in the CCR may have to find housing in the RCR. Transaction volume in the core central region (CCR) which includes the traditional prime districts 9, 10 and 11, as well as the financial district and Sentosa Cove; and outside central region (OCR) on the other hand remained flat. Rental transaction volume in CCR registered 2,165 transactions in Q1 2012, a small dip from the 2,181 transactions clocked the previous quarter. Within OCR, transaction volumes increased slightly, from 2,604 in Q4 last year, to 2,656 in Q1 2012. Overall, the volume of rental transactions in Q1 saw a 7.0 per cent increase, quarter-on-quarter. One of the reasons driving transactions volumes in the RCR could be tighter rental budgets, as companies reduce expatriate hiring and housing allowances, suggested consultants. “With less flexible rental budgets these days, expatriates who formerly could rent in the CCR may have to find housing in the RCR. Although their rental budgets are currently smaller than they were before, but by RCR standards, they are still very generous. This has the effect of driving up rentals and transactional volumes there,” said Savills Singapore research head Alan Cheong. Indeed, looking at the overall rental transaction volume in Q1, the figures imply strong leasing activity despite making a seasonal adjustment, said HSR Property Group special adviser Donald Han. “Leasing activity usually peaks in the second and third quarter as tenants prefer to settle down prior to the year-end festivities and holidays. On a seasonally adjusted basis, Q1 usually reflects a slower rate of activity compared to Q4,” said Mr Han. “(The SRX figures) may imply strong leasing activity in Q1 despite making a seasonal adjustment. As for Q1 2012’s rise in activity, this could be due to looser immigration policy prior to tightening measures in 2011/2012,” he added. Despite the jump in RCR transaction volumes, average RCR rental rates saw a minor increase of 1.9 per cent, from $3.69 per square foot (psf) in Q4 2011, to $3.76 psf in Q1 2012. Lee Sze Teck, senior manager, research and consultancy, at DWG, suggested that even as the number of sizeable projects in the RCR obtaining their Temporary Occupation Permit in Q4 2011 – including Trevista, and Reflections at Keppel Bay – drove up transaction volumes, the increase in supply could have capped the average rental rate increases. 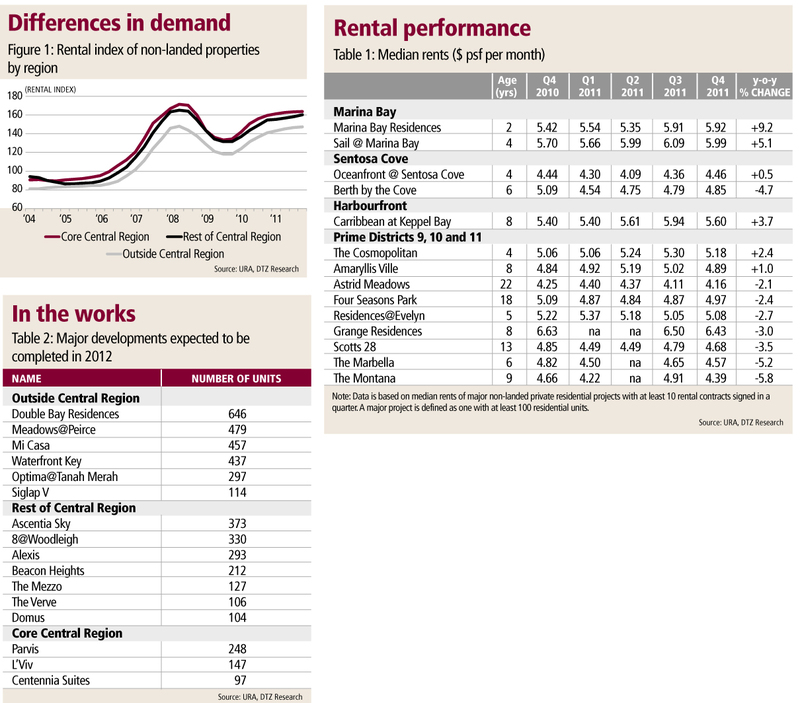 In the core central region, average rentals dipped slightly, from $4.68 psf in Q4 last year to $4.66 in Q1 2012. Average rent in the OCR too dipped from $2.99 in the previous quarter, to $2.98 in Q1 2012. Savills’ Mr Cheong agreed, noting that as more shoe-box apartments, which command higher dollar psf rentals, are completed and rented out, they could result in rental rates increasing. In a report released earlier this week, Savills noted that although hiring has slowed, many businesses which have traditionally relied on expatriate employment are expected to take time to restructure their manpower needs. Consequently, more tenants have been renewing their leases for shorter terms of six months to a year. In addition, surging home prices and the implementation of the additional buyer’s stamp duty has fuelled leasing demand. “The rental rate for non-landed homes may continue to rise in the coming months by another 1-2 per cent,” said Savills. Based on deals closed by the company, average rent for studio apartments and one-bedroom units averaged $6.21 psf per month in Q1 2012. In particular, selected small-format units, particularly centrally located properties, were seen to fetch attractive rents. A 600 sq ft unit at The Suites at Central along Devonshire Road for instance was rented for $5,000 per month ($8.33 psf per month) while two 592 sq ft units at Martin Place Residences along Martin Road were let at $4,200 per month ($7.09 psf per month). RENTAL growth of private residential properties slowed down significantly to 3.8 per cent in 2011 from 17.9 per cent in 2010, according to the Urban Redevelopment Authority’s rental index. Much of the 2011 rental growth was in the first half (2.5 per cent) compared with 1.2 per cent in the second half. In particular, rents almost stagnated in Q4 with only a 0.4 per cent quarter-on-quarter (q-o-q) increase. The second half of 2011 was less optimistic due to the worsening of the eurozone debt crisis with companies reducing expatriate hiring and housing allowances. Rental growth was also hampered by the larger addition to the stock, as around 7,800 units were completed in H2 2011 compared with around 4,600 units in H1. Government policies also played a part in the rental market. In 2011, the government implemented a series of measures to regulate the inflow of foreign labour. The qualifying salaries for certain employment pass holders were raised on July 1, 2011 and again on Jan 1, 2012. The increase in qualifying salaries not only reduces demand for foreign labour but may also be passed on to the employees in terms of smaller housing allowances. Non-landed rents in suburban areas posted the best performance in 2011. According to Urban Redevelopment Authority (URA) statistics, the rental index of non-landed properties for Outside Central Region (OCR) recorded the best performance compared with that in the Core Central Region (CCR) and the Rest of Central Region (RCR) in 2011. The rental index for OCR rose 4.7 per cent while that for CCR and RCR increased by 2.6 and 3.5 per cent respectively in 2011 (Figure 1). The tighter housing allowances and hefty increase in rents from 2010 led to stronger demand for apartments in the suburban areas which command a smaller rent quantum compared with those in the city areas. Non-landed rents in suburban areas posted the best performance in 2011. According to URA statistics, the rental index of non-landed properties for Outside Central Region (OCR) recorded the best performance compared with that in the Core Central Region (CCR) and the Rest of Central Region (RCR) in 2011. In addition, the proportion of non-landed completions in the OCR was also smaller compared to the CCR and RCR. Around 41 per cent of the non-landed completions in 2011 were located in the CCR, followed by 32 per cent in the RCR and only 27 per cent in OCR. Due to weaker demand coupled with higher supply-side pressure, rental growth of non-landed private homes in CCR has started to moderate; the rental index rose only 0.1 per cent q-o-q in Q4. In comparison, the non-landed rental index for RCR and OCR increased by 1.2 per cent and 0.5 per cent respectively. In particular, older properties in the CCR faced competition from the newly completed properties as more units are available for rent and tenants become more selective, preferring newer projects with more up-to-date finishes and facilities. Rents in Marina Bay held up better than other micro markets of CCR. The rental performances in different parts of CCR varied in 2011. Median rents of residential properties around Marina Bay obtained from URA’s website showed that they performed better than median rents in Sentosa Cove (Table 1). This is likely due to Marina Bay being closer to the tenant pool working in the CBD and the area has many activities and events providing buzz and vibrancy. The predominantly smaller-sized units command higher rents on a per square foot basis and attract singles and couples who work around the financial district. The relative inaccessibility of Sentosa can be a major deterrent for tenants, especially if they do not drive to work. Condominiums in Sentosa Cove also face competition from the prime districts 9, 10 and 11, where bigger units are also available to cater to the needs of families. Rents in the nearby Harbourfront area also held up better than those in Sentosa Cove as they are more conveniently located on the mainland and closer to transportation nodes and retail amenities. In the prime districts of 9, 10 and 11, the rental performance was mixed across different projects (Table 1). Based on a basket of condominiums tracked by DTZ Research, rental values of non-landed private homes and luxury condominiums in prime districts of 9, 10 and 11 rose 4.1 per cent and 1.3 per cent respectively in 2011. However, the rental market in the prime districts has turned negative in Q4 as rents of non-landed private homes declined by 1.6 per cent q-o-q and those of luxury condominiums fell by 2.6 per cent over the same period. Rental demand in 2012 is expected to be weaker due to lower foreign hiring as a result of a projected slower business climate and tighter government policies. This may be mitigated somewhat for a temporary period by the imposition of the 10 per cent additional buyer’s stamp duty (ABSD) on foreign purchase as some foreigners who had intended to buy may turn to renting a flat for accommodation. However, they may be tempted back to the purchase market if prices fall. Rental growth is also expected to face supply-side headwinds from the large number of completions. URA’s islandwide private non-landed residential vacancy rate has crept up from 5.5 per cent in Q1 2011 to 6.8 per cent in Q4 2011, as the increase in supply of 11,710 units in 2011 was not matched by the increase in demand of 7,126 units. According to URA’s statistics as of Q4 2011, 12,639 private non-landed residential units are expected to be completed by 2012, around 22 per cent higher than the three-year historical annual average completion of 10,375 units. URA’s estimates tend to fluctuate quarter to quarter and may differ from actual completions as developers adjust their completion dates. The annual average private non-landed home completions in 2012-2014 is even higher at around 15,500 units, suggesting a high level of completions in 2012 even if developers were to delay or bring forward completion dates. The three-year historical annual demand is lower at around 8,270 units. Rents in the OCR, which have performed best in 2011, are also expected to face supply-side pressure as there are a number of projects to be completed in the suburban areas in 2012 (Table 2). Demand will however be supported by the growing number of tenants with smaller housing budgets. With a weaker rental market anticipated in 2012, rents for newer properties in close proximity to transportation nodes will hold up better than the older ones. BEING labelled a ‘city of costs’ is no misnomer for Singapore, which ranks third in Asia’s most expensive locations to rent a three-bedroom apartment – with typical rents estimated to set one back by about US$5,570 per month, according to ECA International. However, Singapore’s rental growth in domestic dollar terms has remained conservative in the past year, with average rents for an unfurnished three-bedroom apartment rising 3 per cent, placing it among the lowest in the region and a stark contrast to the previous year when rents rallied by over 10 per cent. But when the effect of a stronger Singapore dollar is thrown into the picture, the whole ballgame changes. For instance, US companies that send their employees on international assignments to Singapore may face a greater cost impact if currency movements go against their favour. ‘In Singapore, rents have risen by just 3 per cent in local currency, but the strength of the Singapore dollar means that when we convert these prices into US dollars for comparison, the increase stands at 15 per cent,’ explained Mr Quane. At a regional level, rents for three-bedroom apartments in Asia have risen by 5 per cent in local-currency terms over the last 12 months and 10 per cent in US-dollar terms. This translates to average rents of about US$3,680 a month in Asia, almost 20 per cent higher than the global average of US$3,080. Hong Kong remains at the top of the list for Asia and the world with an average rent for an unfurnished three-bedder unit coming in at around US$11,813 per month. ‘This is a 15 per cent increase over the past year in local-currency terms and double the amount it costs to rent a similar property in Singapore,’ said ECA. Mainland China locations have seen the sharpest increases in Asia as the influx of international assignees continue to spur demand for rental properties there. In addition, with home prices continuing to dig for a bottom in China, many locals have chosen to ride with the rental option for now. Tokyo has registered the greatest dip in rents on the back of lower international assignee numbers following the 2008 global financial crisis and more recently, the tsunami and nuclear disaster. ‘This means there is less demand for rental property in expatriate areas, and rents in those areas have steadily fallen since then, dropping almost 5 per cent in yen terms,’ said Mr Quane. Rental rates for property in Singapore have remained among the top 10 most expensive globally. According to data from ECA International, Singapore preserves its current standing as ninth most expensive city to rent property globally, and third most expensive in Asia. However, the city-state ranked behind Hong Kong and Tokyo, which continues to dominate as the world’s most expensive and second most expensive locations, respectively. The average rent in Singapore for an unfurnished 3-bedroom apartment rose 3 per cent last year in S$ terms, one of the lowest in the region. This is much lower than the previous year when rents rose over 10 per cent. Lee Quane, regional director of ECA International, Asia, attributes this phenomenon to the increasing number of expatriates in Singapore, based on its strong recovery following the 2008 economic downturn. ECA statistics suggest that cost of accommodation is largely determined by companies sending employees to reside overseas. Significantly, expatriates in Singapore tend to favor the more expensive regions of the City, due to various factors such as embassies and international schools. While a number of recent property developments have served to alleviate pressure on property rental prices, the strengthening Singapore dollar has caused significant increases in rental rates, especially for foreign companies funding the rent of their expatriate employees. Typically, the rent for an unfurnished three-bedroom property costs $6,984 in Singapore. Comparatively, a property of similar profile would cost $11,813 per month in Hong Kong, which leads the global market in highest property prices. Rental prices at coveted locations like the Peak, can even reach around $19,000 per month. Mr Quane further suggests that this is largely due to limited supply of rental property, but an increasing demand from both expariates, as well as locals who cannot afford to purchase their own property. The stellar performance of Asian economies in 2011, has led to an overall increase of expatriate populations in the major cities. Average rental rates in Asiahave risen to $3,680, surpassing the global average by nearly 20 per cent. China, particularly, has seen a large influx of foreigners on work assignments, creating a high demand for rental property. Interestingly, rental prices in Japan still remained second-most expensive in the world, even despite declining expatriate numbers due to the tsunami and nuclear disasters of 2011. The strong yen has played a fundamental role in sustaining high prices. ‘The currency has increased by more than Tokyo landlords have lowered rents’, asserts Mr Quane. Globally, average rental prices for smiliar three bedroom properties have risen from $2,750 in 2011 to $3,080. Major cities such as New York, London and Moscow all retained their comparatively high prices globally. Read Also Apartment Rents S’pore 3rd Highest in Asia………. The rental market in Singapore is expected to be more active in 2012, as foreigners choose renting over purchasing their home, said DTZ on Thursday. ‘Foreigners who have to pay the additional buyer’s stamp duty (ABSD) may now turn to the rental market instead of buying an apartment or condominium,’ said Margaret Thean, DTZ’s residential executive director. At present, rental demand for suburban condominiums have seen an increase due to the increasing number of foreign professionals without the huge housing allowances previously accorded to expatriates working in Singapore. In 2011, condominiums in the suburban areas posting the greatest increase of 8.9 per cent year-on-year, while rental growth of luxury condominiums was the slowest with a 1.3 per cent growth on a year-on-year basis. RESIDENTIAL rents in the city fringe areas are rising steadily, narrowing the rental gap between the prime districts and the city fringe, noted CBRE in a new report yesterday. CBRE’s latest analysis of residential non-landed rents points to a steady increase in the ‘rest of central region’ (RCR) – which covers the city fringe areas of Balestier, Bishan and Geylang – since the rental market bottomed out in 2009. Rents in the RCR stood at a median of $2.86 per square foot (psf) at the height of the market in 2008. They fell to $2.64 psf in 2009 but then rose 19.3 per cent to $3.15 in 2010 when the market recovered. Rents in the RCR stood at $3.36 psf at end-September. ‘The increase in rents in the rest of central region corresponds to the rise in the number of small-format-sized apartments in Serangoon, Balestier and Geylang over the last few years,’ said Li Hiaw Ho, executive director of CBRE Research. Rents in the prime core central region (CCR) recorded a lower increase of 15.6 per cent over the 2009-2010 period. Prime rents recovered to register $4.30 psf in 2010, after having fallen to $3.72 psf in 2009. As at end-Q3 2011, CCR rents stood at $4.45 psf. This means that the rental gap between the RCR and the CCR areas has narrowed from 29 per cent in 2009 to 24.5 per cent in Q3 2011. CBRE projects that the gap will probably stabilise at around 26 per cent by end-2011 as rents in both the CCR and RCR remain at current levels in the coming months. Apartments near MRT stations in the outside central region (OCR) – a proxy for suburban locations – have also risen in popularity, noted Mr Li. Average rents in the OCR have seen steady increases too, according to the CBRE report. In 2010, rents increased 17.5 per cent to $2.68 psf from a low of $2.28 psf in 2009. By the end of Q3 2011, rents in the OCR had risen to $2.86 psf. CBRE’s report also said that since 2008, the number of tenancies contracted (comprising new leases and renewals) has exceeded 30,000 every year. Between January and September 2011, the number of tenancies stood at 31,083. Total volume of tenancies will probably hit an all-time high of between 37,000 and 38,000 this year, the property firm predicted. But as the impact of the economic slowdown begins to filter through, CBRE expects a lower volume in the coming year.